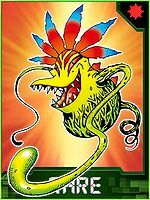 An Insectivorous Plant Digimon with long, outstretched vines and a wide, open mouth. Although it is a fierce, brutal Digimon that uses the sweet scent it breathes from its mouth to attract small Digimon and its long, tentacle-like vines to pull them in, it is unable to stand against larger Digimon due to its lack of offensive power. As Vegimon grows, it will start flowering and eventually bear fruit. — Digimon Adventure: "Oh Friend! Were Garurumon"
n., From "vegitable", a common misspelling of vegetable. Anime/Manga Digimon Adventure: "Oh Friend! Were Garurumon"
3.1.5 Digimon Savers 3D: The Digital World in Imminent Danger! Unchi Nage  Poop Throw ウンチ投げ N/A Compost Bomber Poops and throws it at the enemy. Throws three leaves at the enemy. Amai Toiki  Sweet Breath 甘い吐息 N/A Sweet Breath/Sweet Whisper Breathes out sweet-smelling pollen to confuse enemy. In "Oh Friend! Were Garurumon", Digitamamon runs a restaurant alongside a Vegimon. Both are rude to Jou, who is forced to work at the diner. Vegimon constricts Jou when Digitamamon fights the Chosen Child's allies, but after Were Garurumon has defeated Digitamamon, Vegimon escapes. A few other Vegimon appear in "Vamdemon, the Castle of Darkness", who were hired by Pico Devimon in order to join Vamdemon's army. A group of Vegimon is led by a Red Vegimon in "King of Darkness, The Digimon Kaiser", all being under the control of Evil Rings. Vegimon appears as an obtainable Adult-level Virus type Digimon in Digimon World. 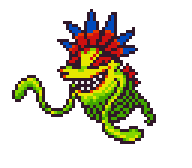 After you recruited Palmon, in the planters Tanemon will talk you about a mysterious plant growing in the Tropical Jungle. Every 15th day of the month Tanemon will plant a Rain Plant (雨降り草の実 Amefuri Sou no Mi, meaning Rainfall Plant Seed) and if you bring it to the Tropical Jungle you'll see a tiny sprout asking for water. 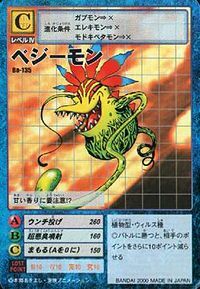 Use the Rain Plant and a Vegimon will finally grow and reveal itself, thanking you and joining the city, replacing Palmon in the Meat Farm, which now gives 3 pieces of Sirloin (極上肉 Gokujou Niku, meaning First-Rate Meat) that satisfy Digimon more than Palmon's Big Meat. Sometimes he'll handle out 5 pieces. Unlike Palmon, Vegimon no longer allows you to buy Sirloins though he instead sells Super Carrots (挑戦ニンジン Chousen Ninjin, meaning Challenge Carrot) and Hawk Radishes (サクラ鳥大根 Sakuratori Daikon, meaning Sakura Bird Radish) for 500 Bits each. Bonus conditions: Have at least a Happiness of 50% and have at least 21 different techniques mastered. Vegimon's Digivolution item is the Organic Fertilizer which lets any Child Digimon evolve into Vegimon. Vegimon spews out a nasty, foul purple breath that intoxicates and poisons the enemy. Vegimon is an obtainable Digimon. Evolves from Mushmon (0 DP) and can evolve to Jyureimon (0+ DP). 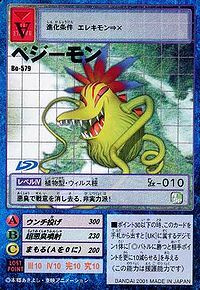 Vegimon appears as an opponent and an obtainable Green Card. 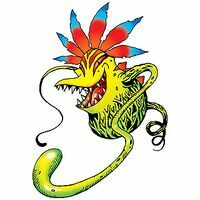 Can be evolved from Floramon if above 16, or can be found at Packet Swamp. It can evolve to Blossomon if above level 24. Can be evolved from Floramon if above level 23 and Bug Grass EXP 500. Evolves from Kunemon, Palmon or Floramon. Can evolve to Atlur Kabuterimon (Blue), Jyureimon or Vademon. 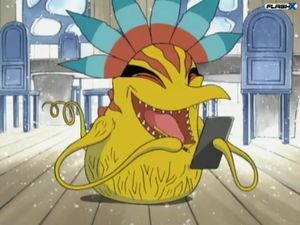 Evolves from Gabumon or Elecmon when the requirements for the other evolutions are not fulfilled. Can evolve to Vademon. Can be obtained as a Burst Evolution of Kudamon. Evolves from Agumon (R), Agumon Hakase, Gabumon (L), Gaomon (L), Gottsumon, or Guilmon (R) when conditions for other evolutions are not met. Can evolve to Anomalocarimon, Digitamamon, Piccolomon, or Rize Greymon (R). Watch out for its sweet scent!? Although weak, it uses its stench to erase its opponents' fighting spirits! This page was last modified on 6 March 2019, at 20:58.